Upscale hot-spot is the place to be on Park Avenue. 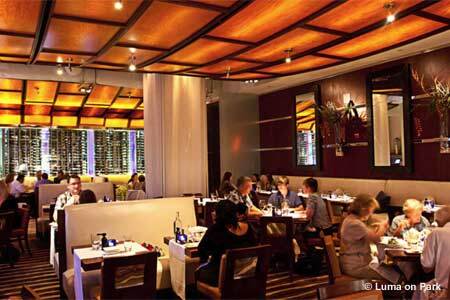 : Restaurants tend to come and go on this gilded avenue, but Luma on Park has maintained its sleek, chic crowd with better-than-average fare, a hip bar and streetside tables. The noisy dining room has a Manhattan hipness: a lively open kitchen, rich woods and billowing white curtains. Start with a specialty cocktail as you browse the ever-changing seasonal menu. You could make a meal of small plates; favorites include citrus-cured cobia fish, roasted cauliflower-beet ravioli, oxtail-stuffed quail with Fuji apple chutney, and a roasted squash and herb ricotta pizza. Entrées range from local red snapper to chestnut-stuffed chicken leg with mascarpone-butternut squash purée, and prime New York strip steak. For dessert, try the banana pot de creme with coconut sucre crumble, milk jam and vanilla crema. There are 80-plus international wines, all offered by the bottle, glass and half glass. More than 7,000 bottles are kept in a lighted, glass-walled vault with a staircase that leads to the cellar, a private dining room that formerly housed a bank vault.